Etsy Update 6/3/12… and Giveaway! Yes, yes, giveaway! But first, let me tell you what’s new in the shop! I’ve introduced a new option to customize colors when you order a Wolfy Baby or a Viking Hat; just pick the two colors you’d like and I’ll whip ’em up for you! 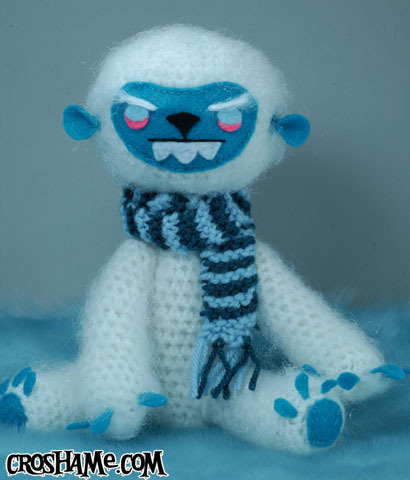 Next up, Wolfy Baby’s new distant cousin, Yeti Baby. Available here! Last but not least, the popular “Anton Crochet” devil cap — as seen at Maker Faire! Found here. OKAY! Now onto the GIVEAWAY!! Starting today and lasting through the month of June, anyone who makes a purchase (within the U.S.) from the Croshame Etsy Shop will be automatically entered into the 1st Official Croshame Customer Appreciation Giveaway! Your very own Anton Crochet Devil Cap (available in Small, Medium, or Large)!! 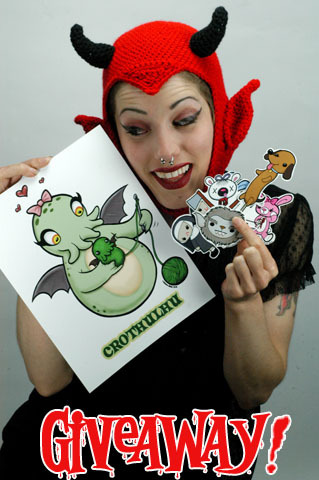 All you have to do for your chance to win is to buy something from the Croshame Etsy store! (Again, giveaway applies to orders made within the U.S. only.) Numbers will be assigned to customers in the order that they purchase items. If you purchase more than one item, you’ll be entered more than once! (Oh happy day.) The winner will be chosen via a random number generator and announced on the blog July 1st, and the winning entrant will also be contacted through their Paypal/Etsy email address. This entry was posted on June 3, 2012 by croshame. It was filed under Croshame, Etsy Store .